Gold-eagle reports about the Preemptive Selling of Gold. A June 1996 high standard deviation preemptive selling episode brought about a downward directional change in the 200-day moving average of gold prices. Immediately following that change in trend, the two banks that later became J.P. Morgan Chase reported unprecedented one-time growth spurts in their interest rate derivatives, which are related to gold prices. Trading patterns in gold and interest rate derivatives are presented and striking correlations are shown, suggesting that a larger macro-economic strategy involving interest rates has been associated with gold and preemptive selling. This strategy has also impacted the interest rate sensitive government-sponsored enterprises. Current, deteriorating economic fundamentals are displayed, further suggesting that the gold and interest rate strategy is under duress. In closing, the work of currency crisis experts relating to exhaustion of gold reserves during unsustainable policy periods is briefly discussed. Previous articles on preemptive selling in COMEX gold showed a 4.22 standard deviation preemptive selling event -- the highest in the series -- in June 1996. Shortly thereafter, the gold price fell below its 200-day moving average and gold entered into a multi-year bear market. Stacked Figures 1 and 2 below show preemptive selling and the average monthly COMEX price of gold presented in time synchrony with each other. Gold's 200-day moving average is displayed in black. Changes in the direction of this indicator often mark important turning points in financial trends. Both charts have synchronized vertical time lines marking the end of June 1996. The 1995-96 period also marked notable changes in other indicators relevant to gold. The inverse relationship between gold prices and long-term real interest rates described by Gibson's paradox broke down around the second quarter of 1996. See Gibson's Paradox Revisited: Professor Summers Analyzes Gold Prices. In a June 2002 speech reviewed (with chart) in Money in Court: Paving the Road to Ruin, Peter Warburton, author of the highly regarded Debt & Delusion (Penguin Books, 1999), identified 1995 as marking what he called "The Fed's wrong turn" (see chart), or, as he put it: "the implicit or explicit decision to ignore an escalation of the public and RoW surplus (= combined private sector deficit) and not to raise interest rates/tighten credit conditions. Basically, it was the Fed's responsibility to reactivate the private sector saving reflex to help finance the corporate deficit and to restrain the corporate sector from taking on too much debt." These studies, like my research on preemptive selling, demonstrated anomalous economic behavior when compared with historic patterns. 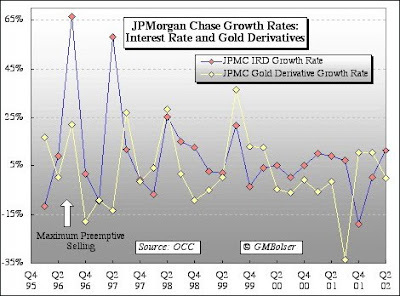 The data in the present study further correlates the growth of J.P. Morgan Chase's huge positions in gold and interest rate derivatives with the decline in gold prices that began in the pivotal second quarter of 1996. Basic data on JPMC's gold and interest rate derivatives is contained in quarterly reports issued by Office of the Comptroller of the Currency. This information is summarized and periodically updated in charts at the end of GOLD MARKET REGRESSION CHARTS. Although Chase and J.P. Morgan merged at the end of 2000, the OCC reported their derivatives data separately until the last quarter of 2001. 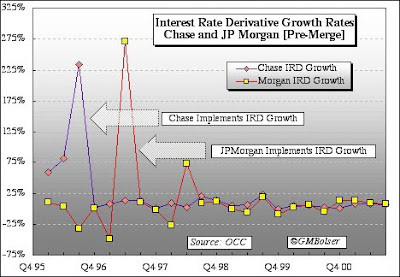 As shown in figure 2, in the quarter immediately following the June 1996 preemptive selling spike, the combined interest rate derivatives (IRDs) of Chase and Morgan nearly doubled. In fact, as shown in figure 3 below, Chase led Morgan by more than a quarter in the rapid buildup of IRDs, adding to their position by 225% in the third quarter of 1996. Morgan followed with an even larger percentage move in the second quarter of 1997. Neither of these major forays into IRDs took place until after gold's 200-day moving average, reacting to earlier bouts of preemptive selling, had given a strong bearish signal for future gold prices. The simultaneous occurrence of three unlikely events -- a 4.22 standard deviation preemptive selling event, a downside reversal in gold's 200-day moving average, and a 225% growth spurt in Chase's IRDs -- is hard to ascribe to simple coincidence. Nor does it appear likely that preemptive selling can be explained solely as an effort to manipulate gold prices, particularly since precious metals trading accounted for only a very small percentage of total trading revenues at either Chase or Morgan. What seems more probable is that these events reflected a coordinated effort to hold down long-term interest rates based on a strategy developed with an eye to Gibson's paradox: the empirical observation based on two centuries of experience that under free market conditions the price of gold rises as real long-term interest rates fall. In today's world, rising gold prices are usually taken as a leading indicator of inflation, presaging in due course rising interest rates, which themselves will in turn ultimately bring falling gold prices as the "sterile" asset falls victim to high real yields in government bonds. More Coincidences. Close examination of the growth rates of gold derivatives versus those for IRDs reveals similar patterns in each. As shown in figure 4 below, each spike in the growth rate for IRDs is generally accompanied by a corresponding jump in the growth of gold derivatives. The last two quarters of 2001 are an exception, where an unusually large one time reduction in Morgan's gold derivatives in the third quarte r may have been related at least in part to the consolidation of Chase and Morgan's reported derivative positions during the final quarter. Since 1997, mortgage loans and mortgage backed securities issued by Fannie Mae (FNM) and Freddie Mac (FRE) have grown explosively. 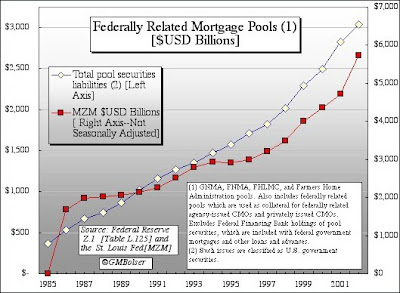 On the left axis, figure 5 below shows aggregate federally related mortgage pools, including FNM, FRE and other government-sponsored enterprises (GSEs) with like activities, as reported by the Federal Reserve (http://www.federalreserve.gov/releases/z1/current/annuals/a1995-2001.pdf). Money of zero maturity, which displays similarly robust growth, is charted on the right axis. The data is current through the second quarter of 2002. If the telecom debt Bubble was ridiculous during the 1999 "blow-off," this year's excesses throughout mortgage finance are absolutely outrageous. It is simply difficult to fathom a system creating new mortgages at a $3 trillion annualized pace. It is certainly beyond credulity to believe these Credits are being created well. And while the system is (hopefully) not in the process of lending to frauds of the scope of Worldcom, only time will tell to what extent mortgage brokers, bankers, and appraisers are today pushing the envelop (we'll bet they are pushing mighty forcefully!). Only time will also tell to what extent troubled borrowers are extracting every penny of equity in a desperate attempt to stay afloat. But there is absolutely no doubt that tens of billions of problematic Credit card debt is being transformed into mortgage balances. There is no doubt that equity extraction has financed unprecedented consumption. Uncharted Waters. In considering the bigger picture painted by the foregoing charts, two old but contradictory admonitions come to mind: (1) do not take for conspiracy what can just as easily be explained by stupidity; [Exactly! I BELIEVE in stupity] and (2) in politics nothing happens by coincidence. If the Clinton administration's much-touted strong dollar policy was anything more than mere jawboning, it seems to have been effected in major part through the suppression of gold prices with lower long-term interest rates as a primary objective. Derivatives were the tool of choice, explaining the uniform and strong opposition of the Fed and the Treasury to any meaningful regulation of these powerful instruments (see Olympic Special: Will the Enron Tar Baby Go for the Gold?). Whether through design, poor policy choices, or a combination of both, the result was an attempt to evade the historic monetary discipline of gold.